Termotek GmbH is a specialist for active cooling systems with a small footprint. The wholly-owned subsidiary of technotrans AG offers cooling solutions for laser applications in the lower and medium power range. After having exclusively established the 24 V Aspen mini-compressor on the market, Termotek will now also use a new miniature rotary compressor by Samsung. With a cooling capacity of up to 500 W and a low-vibration set-up, the device is suitable for numerous sensitive work environments. “Especially when it comes to sophisticated applications, we see high potential for this compressor,” explains Peter Hirsch, managing director of Termotek. The product development team was able to reduce the size and weight of the compressor approximately to the dimensions of a 250 ml beverage can. 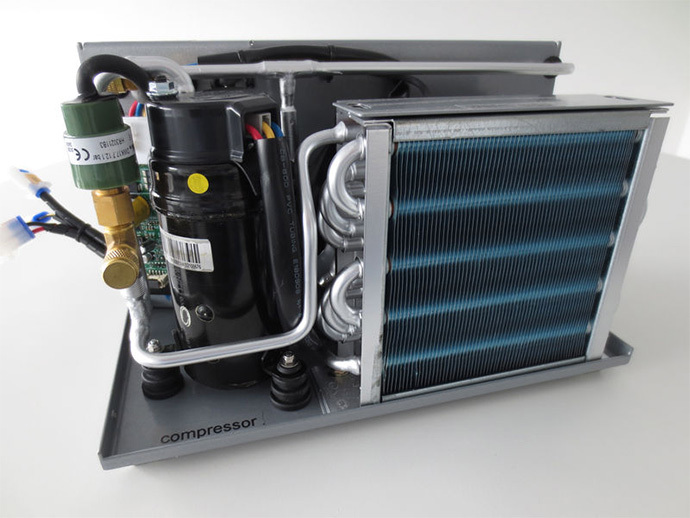 As a result, the new compressor measures and weighs only approximately one quarter of other commercially available solutions. This makes it highly attractive for mobile applications. Furthermore, numerous vibration and noise-sensitive applications can also benefit from this product, for example laboratory applications, medical systems, laser cooling systems and small refrigerators. The optimised layout considerably reduces the sound volume of the compressor. “High power density with consistently smooth operation is a convincing feature for all branches of industry,” says Peter Hirsch. In addition, the mini-compressor is about to become an alternative with regard to classic Peltier cooling systems, which reach their performance limit especially at high ambient temperatures. In order to meet the growing demand for small cooling systems, Termotek, as an exclusive distributor for the American company Aspen, has successfully established a 24 V mini-compressor on the market. This mini-compressor is as powerful as any commercially available piston compressor and yet much lighter, more compact and quiet. It is used in numerous customised applications in the field of laser technology, medical engineering, and laboratory equipment. For many years, Termotek has been a renowned manufacturer of liquid cooling systems with a temperature stability of +/- 0.1 K. The company is regarded as a specialist in small active cooling systems. Located in Baden-Baden, Termotek offers customised cooling solutions for laser applications in the lower and medium power range. In the field of compact 24 V mini-cooling systems, Termotek is a leading supplier. The company is part of the technotrans group, which has its headquarters in Sassenberg. The group is a full-line supplier of cooling systems for the laser and machine tool industry as well as in the field of battery cooling applications. “The term underlines that, with our expertise, we can fulfil any type of requirement,” says Peter Hirsch. technotrans group offers a global sales and service network for all of its products.